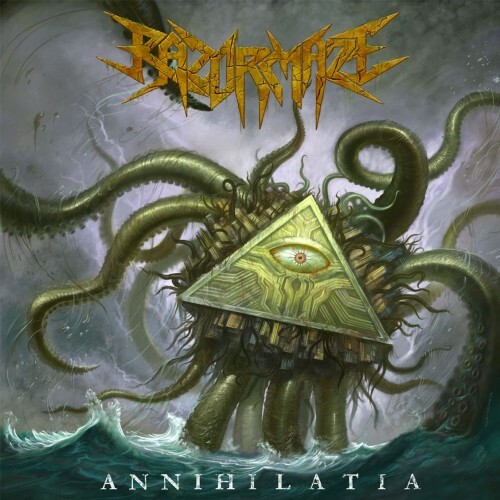 Razormaze is again a thrash metal band that was brought to my attention by Slaney Records, who were already responsible for the release of 2013 thrash gem After You from Prowler. Quite big shoes to fill for Razormaze! Annihilitia is the second full length release of Razormaze. They treat their listener on no frills thrash metal. And with no frills, I really mean no frills. This is really straight forward thrash like it has been done by dozens of other bands. The thrash they serve is a mixture of Slayer and Exodus with some hints of Kreator. So aggressive with some pummelling mid tempo parts, delivered by the rhythm section of Joe Gettler and Sam Nevin. The rhythm section is directly the most notable part of the band. Straightforward and powerful drumming and some interesting bass line here and there. Unfortunately we can’t say that of the guitar lines. No real memorable solos and also no riffs that peak the listeners interest. Same case can be made for vocalist Nick Lazzaro. While he’s not a bad singer by any means and fits the genre perfectly, he’s just a tad boring. Thrash metal is a very conservative genre, but an album still needs to have some surprises and that’s not the case with Annihilitia. While I must say that the album grew on me with subsequent listens, I doubt that I’ll ever pick this one out of my record collection if I need a good thrash metal fix. A decent album, but not interesting enough to compete in my thrash metal rotation. That’s too bad, because with songs like ‘Sink Below’, they show that there’s absolutely talent in this band. Hopefully with their next album that talent will blossom!